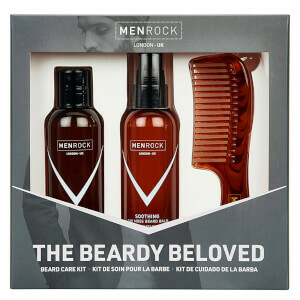 Treat your facial fuzz to Men Rock The Beardy Beloved Starter Beard Care Kit; a balm, shampoo and handy comb that will leave your beard in tip-top condition. Presented in a gift box. 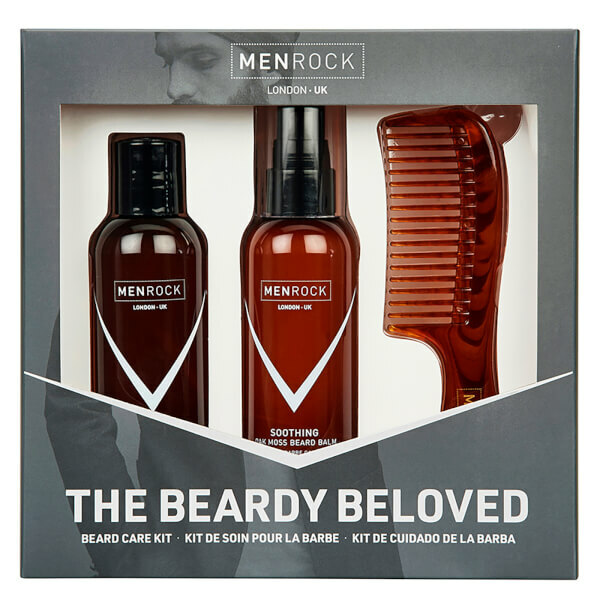 A non-greasy formula developed to soften, condition and nourish your beard and the skin beneath. Infused with the brand's signature Oak Moss scent, the lightweight balm absorbs quickly to leave your facial hair moisturised and soothed around the clock. 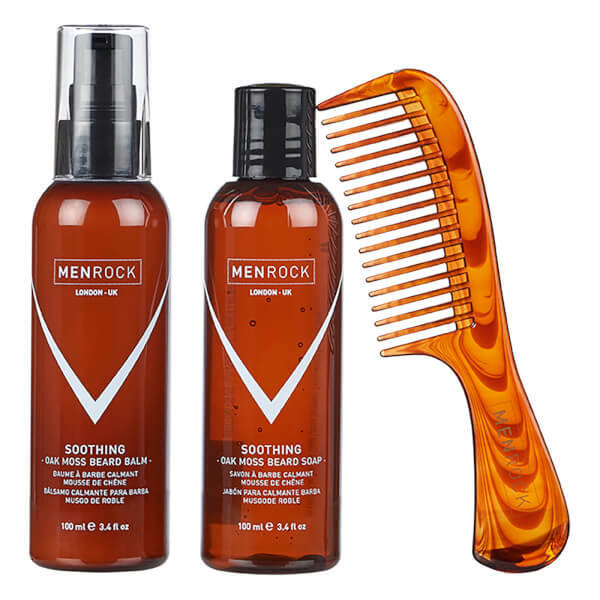 A rejuvenating formula that effectively eliminates impurities from your facial hair, without drying out the skin beneath. 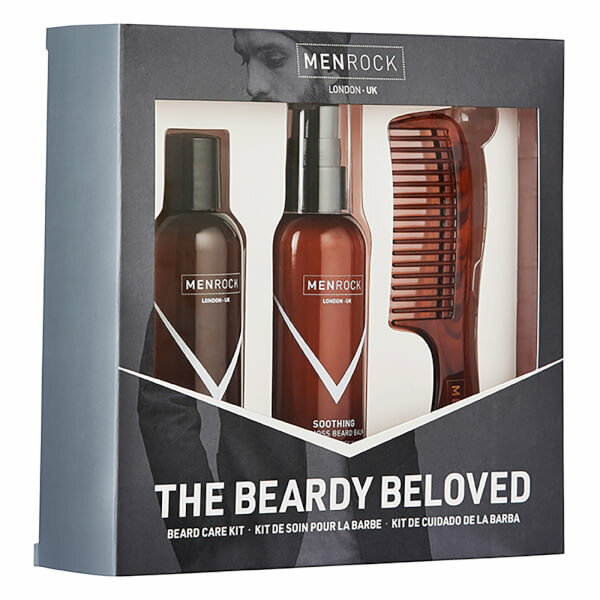 Delivering a gentle yet thorough cleanse, the soothing soap softens and refreshes your beard to leave it feeling healthy and fragranced around the clock. Balm: Aqua, Aloe Barbadenis (Aloe Vera) Leaf Juice, Cetyl Alcohol, Behentrimonium Chloride, Dimethicone, Parfum, Helianthus Annuus (Sunflower) Seed oil, Hydrolysed Wheat Protein, Calcium Pantothenate (Vitamin B5), DMDM Hydantoin, Decyl Glucoside, Citric Acid, Menthol, Benzyl Benzoate, Linalool, Eugenol, Limonene, Benzyl Cinnamate, Cinamal. Soap: Aqua, Sodium lauryl Sulfoacetate, Disodium Laureth Sulfosuccinate, Cocoamidopropyl Betaine, Polyquaternium-7, lauroyl Sacossinate, Glycerin, PEG-150 Distearate, PEG-40 Hydrogenated Castor oil, Parfum, Chloromethylisothiazolinon, Methylisonthiazolinone, Benzyl Benzoate, Linalool, Eugenol, Limonene, Benzyl Cinnamate. Cinamal.